My other obsession right now is the New Land O Lakes® Soft Squeeze™ Spread. 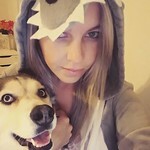 I’m going to confess a deep dark secret to you guys right now. My kids don’t know that butter is supposed to go on pancakes. Because I haaaate spreading butter onto things. Especially when I only have the stick butter because then you have to slice it and the pancakes have to be hot enough to melt the butter or you’re tearing up the pancakes trying to spread butter evenly. Or is that just a me problem? My mom always makes pancakes for breakfast when she visits and they think it’s a huge treat to get butter on them! Yeah, I’ve always told them that it’s not normal for people to butter their pancakes but now? With the New Land O Lakes® Soft Squeeze™ Spread I won’t have to lie to them anymore. I love that Land O Lakes® Soft Squeeze™ Spread is made with real butter and is perfectly squeezable right out of the fridge. No coming to room temperature, no popping it in the microwave to get it spreadable. And is stays clean and crumb free which is another thing I struggle with in a house with 4 boys. It’s also great for making buttery scrambled eggs, squeezing on top of a freshly grilled cob of corn, or drizzling onto some hot popcorn! 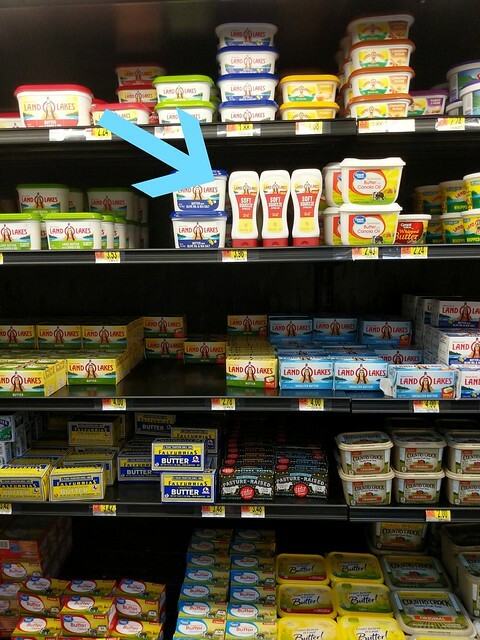 I picked my Land O Lakes® Soft Squeeze™ Spread up at my local Walmart. It’s right next to the rest of the Land O Lakes butter products and right now you can print a coupon to save $0.50 off ONE (1) Land O Lakes® Soft Squeeze™ Spread. Coupon expires 12/31/18. 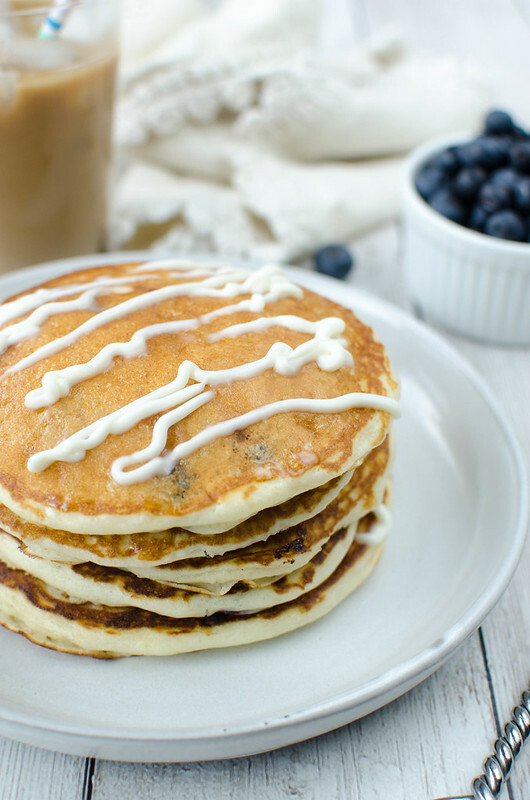 Okay, let’s talk these pancakes. 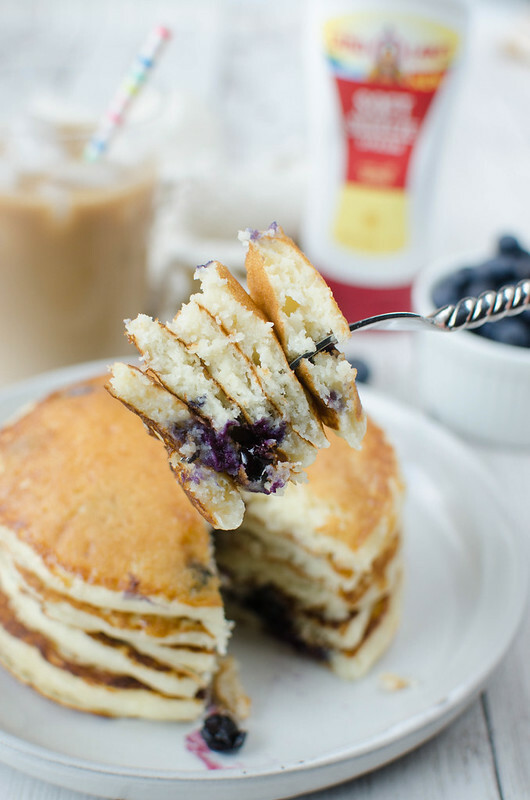 They’re so fluffy and the sour cream gives just the right amount of tang to go with the super sweet blueberries. Because how good are the blueberries right now? We’re going through pints and pints of them and this recipe is definitely one of our favorites. The batter is super quick to mix together and they cook up perfectly on a hot griddle! Definitely feel free to substitute your favorite summer berry. I’ve made these with blackberries and they were also delicious! In a large mixing bowl, beat Land O Lakes® Soft Squeeze™ Spread and sugar until light and fluffy. Beat in sour cream, milk, eggs, and vanilla. Add the flour, baking powder, and salt and beat until combined. Fold in about 1/2 of the blueberries. Use 1/3 cup measure to drop onto a hot skillet greased with a bit of Land O Lakes® Soft Squeeze™ Spread. sprinkle with more blueberries. Once the pancakes start to bubble, flip and cook just another minute or 2, until golden brown. Drizzle with Land O Lakes® Soft Squeeze™ Spread and syrup, if desired! 2 Responses to "Blueberry Sour Cream Pancakes"
I LOVE sour cream in baked goods. 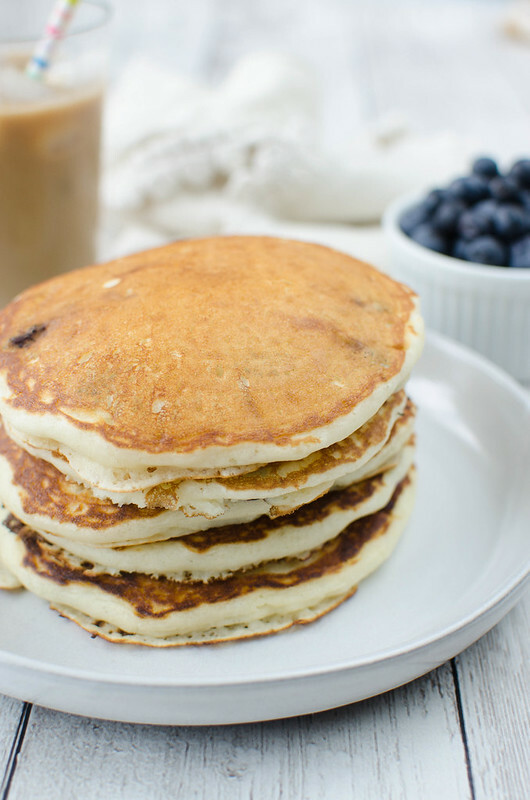 This might be our new favorite pancake recipe! 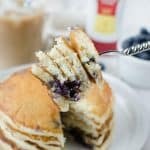 These blueberry sour cream pancakes were a real hit with the family! I love trying out new recipes for Sunday brunch. I’ll definitely be making these again. Yum!